© 2016 by Sheree Renée Thomas. Originally published in An Alphabet of Embers edited by Rose Lemberg. Reprinted by permission of the author. If you have a worry your heart can’t seem to hold, take your troubles to the trees, my grandmama would say. That was in the Old Time, when I was a small girl with scraped knees and ashy legs, a neck full of sun. Her words would comfort me as I grew older, my baby fat yielding to strong woman curves and hips. Then I would fling my arms around my secret tree and whisper my sorrows into her knotty breast. This tree, elder of all elders, witnessed my most private moments, had heard my laughter echoing through the years and drank my tears salty with heartache. In them time I could peel back her bark as if stepping through a ringed door. On the other side of her silence, I was stronger, wiser. I loved to hold her, to feel her weathered breast, a stillness against my skin. And sometimes as I held her, whispering quietly under my breath, I could almost feel her grow, could hear her sing. Her wooden flesh and knotted limbs moved beneath me, swayed and rocked me slowly, as if I were her own true seed. Perhaps this movement, the secret language of trees, was my own creation, a product of my grandmama’s lore. It was she who claimed that the trees that grew along the black ridge of her land carried secrets few would tell. That these trees had seen the first nations rise by firelight and storm, bursting from the earth’s navelstring, had sheltered their swayed backs along a winding and rootless blood trail mixed with tears, had hidden ancient black seed in their limbs like some kind of strange, unforgivable fruit, had sheltered them and not swallowed their lives whole, as did some other bloodless trees, magnolia and oak, cold and less discriminating. Grandmama said the trees that grew around her land were cousin to the Tree of Nations, an ancient breed who had walked with wooden limbs above rising roots and followed its people, chained and carried across the waters with only their memories free inside their heads. Grandmama said it was only these old trees who could move, pick up their roots, gather their seed, and plant them where they will, neither slave to the land nor beholden to the wind and her whims. But I have never truly seen the old trees walk, though I have felt their movements beneath my cheek and their caress on my thighs as I climbed them. Perhaps they have grown weary of their journey, the people they seek now lost in a tangle of upturned roots and knotted bloodlines. Perhaps they no longer walk because the people no longer remember. Or perhaps it is only the young ones, the newborn trees that are more active here on Grandmama’s land. Young trees tend to juba and dance more than their elders think is good for them. Young trees have a secret desire, an inner ache that the elders forget, lost ages ago, the urge dulled by time. And because this desire involves water, not rain or creek or the river kind that wanders around these parts, but salt water, the first water, a return is never spoken of. The elder trees disapprove of this waterlust and say, “The salt is treacherous, for it carried our people away and could not sustain us.” But the young ones try to work themselves into any pool that mirrors the land, hoping it will lead them to De Big Wata and carry them back home to where the people remember their name. They move slowly at first, so the elders won’t notice, then they stretch and whip and wiggle their roots until they are just about free, dipping into a stream during a summer storm or careening on their backs swept by a flood at spring, telling all who will listen, river rock and stone, that they are moving, moving on, that the floodwaters will soon carry them straightback home. On this journey, away from their elders’ knowing limbs, some are dashed at the feet of mountains, some crash beneath the silent arch of bridges and are borne on the raging river’s back to rest at the bank’s knees among stones. Others, uprooted and ruined, dreams splintered and spent, become firewood to fuel new beginnings. But spirits unbroken, they sputter and pitch, refusing to yield to the fire’s touch. And it is Grandmama’s touch that I am missing, Grandmama’s voice that was the last I heard before I went to sleep. On days like this, when I am feeling none too wise and very small, you may find me curled up at the base of an elder tree. She knows all my secrets, all the broken parts of me. There, I carve a moment from the everyday worries of life, close my eyes and reach for Grandmama’s wisdom, close my eyes and listen for a treesong. 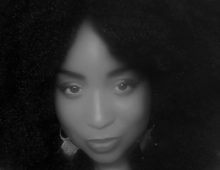 Sheree Renée Thomas is the author of Sleeping Under the Tree of Life (Aqueduct Press), named on the 2016 James Tiptree, Jr. Award Longlist and honored with a Publishers Weekly Starred Review, as well as Shotgun Lullabies. Thomas is also the editor of the World Fantasy Award-winning Dark Matter anthologies (Hachette), Associate Editor of OBSIDIAN: Literature & Arts in the African Diaspora (Illinois State), and is currently co-editing Trouble the Waters: Tales from the Deep Blue (Rosarium) with Pan Morigan and Troy Wiggins. Read her new essay in Luminescent Threads: Connections to Octavia E. Butler (Twelfth Planet) and her short stories and poems in Sycorax’s Daughters, Apex, Harvard’s Transition, Afrofuturismo, Stories for Chip, Revise the Psalm, The Moment of Change, Mojo: Conjure Stories, Strange Horizons, Mythic Delirium, Jalada, So Long Been Dreaming, Memphis Noir, and Mojo Rising: Contemporary Writers. Find her @blackpotmojo or in Memphis, Home of the Blues.